Cisco-Eagle Catalog - Underhung Perpendicular Rail System, 24&#39; x 10&#39;, 10&#39; Underclearance, 850 lbs. cap. Lifts, Cranes & Hoists > Balancer Systems > Rail Systems > Underhung Perpendicular Rail System, 24' x 10', 10' Underclearance, 850 lbs. cap. Underhung Perpendicular Rail System, 24' x 10', 10' Underclearance, 850 lbs. cap. 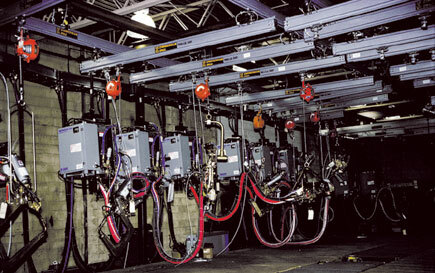 Ceiling supported workstation bridge cranes are ideal for high-volume production environments with limited floor space. They can provide rectangular coverage for a single workstation or an entire assembly line with multiple bridge cranes. This rail system allows you to utilize the ergonomic lifting and positioning power of an Ingersoll Rand air balancer anywhere you have a footprint suitable for the rail structure 24' long and 10' wide. This unit is designed to attach to suitable ceiling steel (perpendicular to the i-beams). 24' long high-capacity, smooth-glide ZRS2 enclosed runway system. Mounted to the runway is a 10' wide ZRA1 aluminum bridge rail where an air balancer is attached (not included; choose balancer in the Accessories tab). Air supply is included. 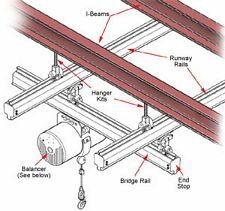 Underhung Parallel Rail System, 24' x 10', 10' Underclearance, 850 lbs. cap. Floor Supported Rail System, 30'L x 15'W, 12' Underclearance, 1100 lbs. Cap.